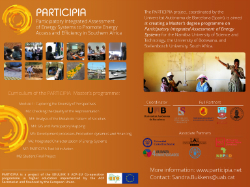 PARTICIPIA −Participatory Integrated Assessment of Energy Systems to Promote Energy Access and Efficiency− is a three-year project funded under the EDULINK II programme; an ACP-EU Co-operation Programme in Higher Education funded by the European Development Fund (EDF) and the Development Co-operation Instrument – Relations with South Africa (DCI). The EDULINK II Programme aims at fostering co-operation in the field of Higher Education between the countries of the African, Caribbean and Pacific Group of States (ACP States) and the European Union (EU), and at promoting innovation in Higher Education Institutions in the ACP Group of States member countries and, hence, at ensuring their competitiveness in the global environment. 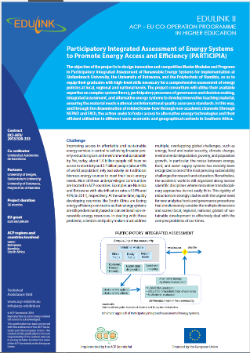 PARTICIPIA specifically aims at developing and implementing innovative and competitive Master modules and/or programs in Participatory Integrated Assessment of Renewable Energy Systems in the ACP-member states Botswana, Namibia and South Africa. In this way, the action seeks to foster access to alternative energy technologies and their efficient utilization in different socio-economic and geographical contexts in Southern Africa. PARTICIPIA is a co-operative effort between three universities from Southern Africa, Stellenbosch University (South Africa), the University of Botswana and the Namibia University of Science and Technology (formerly Polytechnic of Namibia), five universities from Europe, Universitat Autònoma de Barcelona (Spain), the University of Bergen (Norway), Universidad Autónoma de Madrid (Spain), Universidad Carlos III de Madrid (Spain), Universitat Pompeu Fabra (Spain), and two international organizations, FAO and NEPAD. PARTICIPIA is coordinated by the Universitat Autònoma de Barcelona (Spain). The official start date of PARTICIPIA is 02 October 2013. Consult our Project Fact Sheet, Promotional Flyer, or PROMO VIDEO for a quick overview of the Project.